You are tasked with planning an effective trade show booth for your company, you have a limited budget, and you have decided to stick with the smallest, most common booth size: 10×10’. How are you going to stand out from the crowd and use your limited space (and limited budget) to the fullest, while meeting your goals? Representing your company at a trade show is a big investment, but it is also an opportunity to gain more visibility, make professional connections, and showcase your brand. In this blog post, trade show industry experts share their thoughts on the best and the worst of trade show planning and design strategies to consider when planning your 10×10’ booth. Before you start sending out invites and planning your booth design, you need to establish specific goals for your trade show presence. Ask yourself, are you looking to make an impression on your current customers, or attract new ones? Are you trying to establish your brand as a thought leader, build brand awareness in a new arena, or promote the product you just launched? The answers to these questions will determine every choice you make in trade show planning, from the design of your booth, to the pre- and post-show advertising. Once you set these goals, start implementing them early. There are many tools available to you even before you hit the trade show floor. Try buying the pre-show registration list, and connecting with trade show attendees via emails, postcards, and social media before AND after the show. “It is a good idea to cross-reference lists of trade show attendees with a list of your current customers, and send those people personalized invitations so they know you will be there” said Christina Hundschell Dela Cruz, Senior Manager of Business Development at EBD Group, the leading partnering firm for the global life science community. Companies with a small trade show presence might feel the strain of only having a few people to man the booth, but even having the minimum of outgoing, friendly representatives may be the most important part of the experience you are creating for attendees. “You can have the biggest, most optimal booth space, but if you don’t have the best people at the booth, you’ll be missing out on a lot of great opportunities,” said Hundschell Dela Cruz. Ideally, you need to make a schedule so that at least one of your representatives is manning the booth at any given time. “An empty booth can leave a bad impression of your company,” said Hundschell Dela Cruz. Another tip is to use dark colored carpeting in your booth. Almost all aisle carpets are dark colors, and you want to create a seamless transition between the aisle and your booth area. Using a color that is complementary to the aisle, rather than contrasting, will eliminate any invisible barriers. For example, if the aisle carpet is charcoal, try a dark blue rather than white. Beware of oversaturating your booth design. Do not let your back wall graphics become a wall of text that intimidates and alienates people who have never interacted with your company before. “An attendee spends 2.5 seconds looking at your back wall before deciding to step in,” said Saef. Rather than overwhelming passersby with distracting information, you want to pique their interest and get them to stop at your booth. There will be lots of time to explain all the details of your new product once the attendee is hooked. One challenge at trade shows is not only getting attention from attendees, but also creating a space where they will want to stop and stay. One way that trade show booth designers have been one-upping all the candy bowls is by offering real food items, like appetizers, coffee, or even custom cocktails. Not only will food and drink get the attention of attendees, but it creates a more relaxed social atmosphere, perfect for starting conversations about your brand. When planning giveaways or swag for your booth, ditch the pens and USB sticks. Instead, go for something practical that the trade show attendees will appreciate during their time at the event. “If the convention is in a hot, sunny place, try giving away sunscreen or sunglasses, and if you are in a rainy part of the country, perhaps umbrellas,” said Hundschell Dela Cruz. 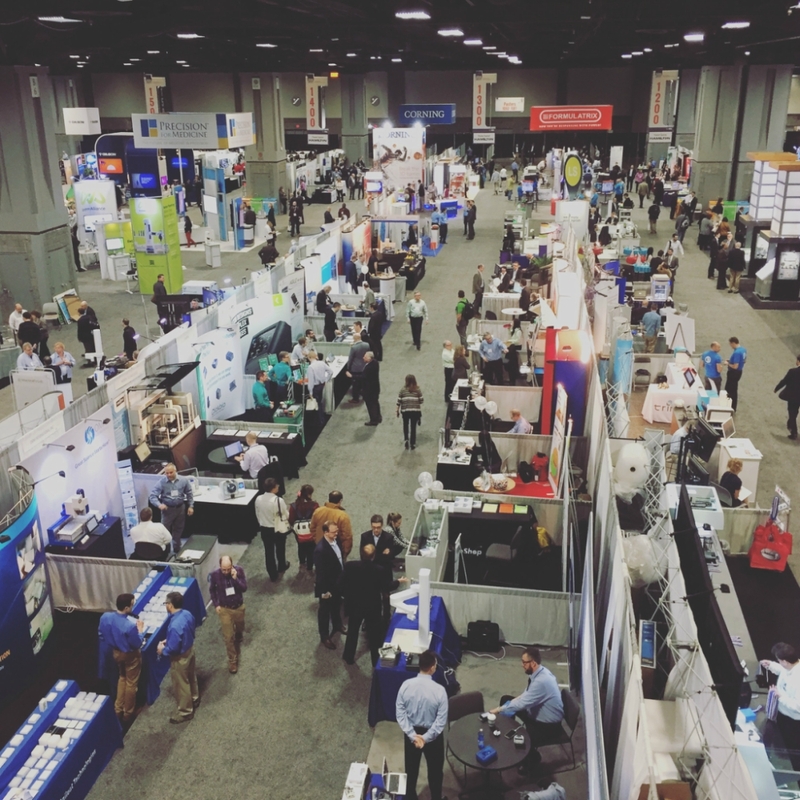 Attendees will be out and about in town, not just in the convention center, so keep the climate in mind when planning your trade show presence. “The best trade show booths are the ones that create an experience,” said Todd Kuna, Senior Account Director at CG Life. Many companies elect to set up a meeting area, and have an interactive exercise related to their brand. This is a big opportunity to get creative and engage people in a memorable way. Virtual reality (VR) is a popular option for booths looking to set up an engaging experience in a small space. Instead of creating a complex, expensive physical display, VR enables you to show attendees a digital display that can expand your small booth into virtual infinity. Never underestimate the power of a tangible, interactive activity or game to spark engagement. When you are face-to-face with your industry peers, trade show booth location is an important factor. While some companies might opt to set up shop right next to their competitor in order to draw upon the same customers, a better alternative might be to find allies at the show. “Sometimes, companies that refer each other business will partner at conferences, so they can bounce people around between their booths,” said Kuna. Companies have even split 20×20 foot spaces with other companies, so they can open up their space. Throughout the show, it is helpful to post updates on social media to broadcast your trade show presence and any events in which you are participating. After the show, it is crucial to follow up on any leads you collected, and have planned touch points to reach the new and old contacts who visited your booth. The final, and perhaps most critical piece of trade show advice, is to carry over the lessons you have learned year after year. Improve on your goals from last year, and investigate the less impactful efforts in your trade show plan. Measure engagement according to your goals, and use those metrics to plan next year’s engagement. And make sure to tie your impact measures to your business outcomes objectives. Then take the time and effort to share what you learned at the trade show with other coworkers to enrich your company as a whole.